"He is a Chess Genius": Emanuel Lasker's 1893 Chicago Herald interview. Though Not Yet 25 Years Old He Has Defeated, All Contemporary Experts Save Steinitz, Whom He expects To Meet Soon - A Career of Conquest. “Chess is not only the most fascinating and intellectual game which the wisdom of antiquity has bequeathed to man, but it is incomparably the most scientific. Separated from the most abstruse of sciences by the faintest line of demarkation,[sic] it is more difficult than integral calculus, according Jaenisch, the Russian mathematician. Richard A. Proctor, who devoted to chess as much study as he gave to astronomy, said, “No man has yet mastered chess, for the plummet of human intellect cannot fathom its depths”, and Sir William Jones declared that a chess genius is not born oftener than once a century." “Since the advent of Paul Morphy, who shot athwart the chess sky with meteoric brilliancy , dazzling by his genius the players of his day and vanquishing such of the American and transatlantic champions as had the temerity to meet him, no player has arisen who was deemed worthy to be his successor or upon whom his chess mantle should fall." “A new star, however, has recently appeared in the chess firmament, who is believed by many to be Paul Morphy's legitimate successor. His genius as effectually outshines the present chess lights as Morphy's overshadowed those of his day." “This new chess genius is Emanuel Lasker, who is now in Chicago visiting the world's fair. “Mr. 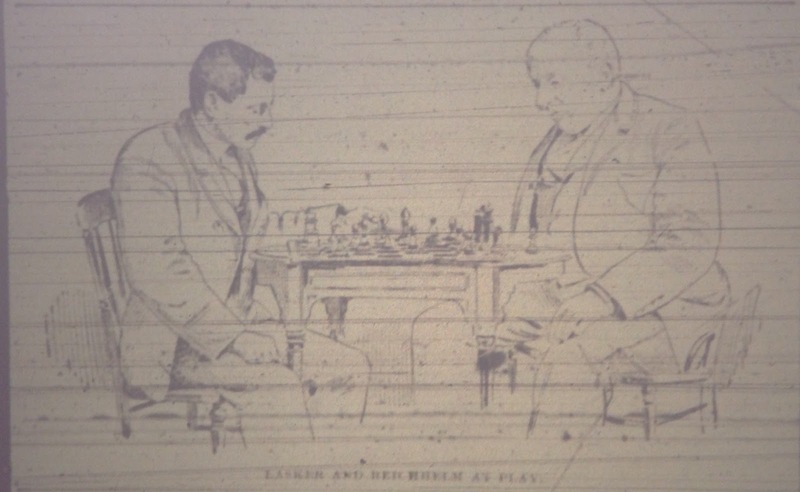 Lasker's public record, although extending over only a brief period, is unequaled by that of any who ever lived not excepting the great Paul Morphy." “The Manhattan Chess club of New York gave Lasker a pressing invitation to fill a month's engagement in New York, and the invitation was gladly accepted by Mr. Lasker, who had a strong desire to visit the United States. He had heard much about the native genius of such players as Delmar, Hodges, and Lipschultz, and he was anxious to test their powers. It was arranged for him to play three games each with the eight strongest players of the Manhattan club. Such able players as Eugene Delmar, Dr. Isaacson, Major Hanhan and A. B. Hodges were pitted against him. He beat with ease one after another of his opponents, the only reverses he suffered being at the hands of the youthful Hodges and the erudite Isaacson, to each of whom he lost one game. The total score was: Lasker twenty-one games, lost two games and drawn one game. This was regarded as a wonderful achievement." “After finishing his engagement with the Manhattan club Mr. Lasker went to Canada and visited the clubs in Quebec, Montreal and Toronto. He enjoyed an unbroken series of victories and was everywhere hailed as the world's greatest players. Altogether he played in Canada fifty-two games, only one of which he lost." “In Brooklyn his success was scarcely less remarkable. The only game he did not score, was a drawn battle with Phil Richardson, one of the strongest players in the United States. In Philadelphia he encountered the veteran Riechhelm, the brilliant Shipley, the scholarly Elson and half dozen other strong players. The only game he lost, was to Shipley. He played nineteen games simultaneously with the strongest team the quaker city could present and not one game did he lose." “Mr. Lasker next visited the clubs of Havana, and defeated the Cuban experts with ease. With Signor Golmayo, Ponce, Vasquez and Ostolazza he played short matches, making clean scores. During his stay in Havana he lost not a game and drew only one. This was a far better score than either Steinitz, Tschigorin, or McKenzie had made against the Cubans." “In New Orleans Mr. Lasker next met the best players of the city, that produced Paul Morphy. Mr. Lasker played for several weeks and won victory after victory. During his stay in the crescent city he was the recipient of many courtesies and was invited to deliver a series of lectures before [illegible word] Tulane university. He lectured on the thesis of 'Linear Differential Equations,' and was complimented, by the faculty of that institution, who requested him to prepare a work on the subject. Mr. Lasker has been busily engaged on this work ever since." “His last and most important match was with Jackson Showalter, of Kentucky, who for two years had held the chess championship of the United States. This match was played at Kokomo, Ind., last April. The stakes were $1,000. At the end of two weeks the contest ended in favor of Lasker who defeated his antagonist by the decisive score of 6 to 2 and one drawn game. At the conclusion of that match Mr. Showalter expressed a desire to back Lasker against Steinitz in a match for $5,000 and the chess championship of the world. Letters came from New York and New Orleans congratulating the victor and offering to help raise the stakes in the event of a match with Steinitz. Mr. Lasker indicated a willingness to measure lances with the hitherto invincible champion, and negotiations were immediately begun. Charles A. Gilbert [Gilberg] of Brooklyn, was named by Lasker as his second, and Mr. Steinitz was communicated with. He replied that a challenge coming from so distinguished a player as Lasker was worthy of consideration, and he would accept it in, the spirit it was sent. The probability of an encounter between Steinitz and Lasker and the possibility that some of the games may be played in Chicago has aroused the local players and awakened great interest in the coming event. The Chicago players will make concerted effort to bring about the match, which will unquestionably be the greatest contest in the annals of chess." reporter was cordially received by the young chess champion. Mr. Lasker possesses a refined and intellectual face, with an unmistakable Jewish cast of countenance. His features are clear cut, his eyes dark and piercing , yet at times bright and merry in their twinkle. His thin, compressed lips evince of strength and firmness are almost hid by the drooping neatly trimmed dark mustache. The glasses which bridge, his firm Roman nose, impart to his visage a sedate and scholarly appearance. The dignity of his bearing. The easy grace of his [illegible word] and the measured reticence of his conversation indicate the artist temperament, and the conformation of the frontal cranium discovers to the phrenologist an abnormal development where the group of intellectual faculties have their abode. Mr. Lasker is not a voluble talker, but he expresses himself easily in good English. When the subject of chess is broached his eyes light up with interest and his conversation becomes animated. “' Yes not only willing, but anxious,' Mr. Lasker replied, with an enthusiastic ring in his voice.